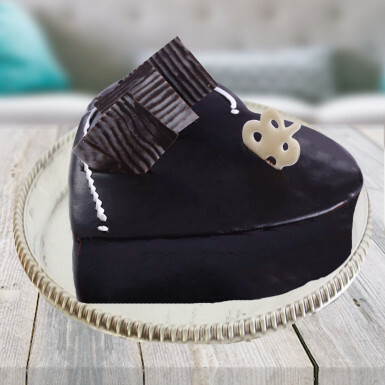 Chocolaty, indulgent and sumptuous are just a few of the words that come to your mind when you think of Heart Shape Chocolate truffle cake so as chocolate truffle cake is the need of the event to make your day a completely blissful event. Gift your husband this cake and make him happy on your wedding anniversary. This romantic cake is composed of chocolate ganache, cocoa powder, hazelnuts, almonds usually in a conical, spherical or curved shape. The names are derived from their shape, which resembles the truffle and is an edible part of the tuber fungus.This Designer cake is prepared in heart shape so that you can gift it to your lover.Heart Shape Chocolate Truffle cake hit among lovers who wish to present a token of love to each other on Valentine's Day, propose day, chocolate day, kiss day, teddy day as well as in occasions like wedding anniversary or birthday. A bite of this yummy cake feels like Belgian chocolate truffles melting into your mouth. Chocolate Truffle is a delicious cake which is surely going to be a great treat to your paramour taste bud and will present your love in a unique lip smacking way. Distance is not a problem as we provide online cake delivery all over India. You can show your emotion to your wife by gifting this romantic cake to her.